Flowers are generally appropriate and appreciated at funerals and memorial services of most faiths. If the deceased was of a different religion or cultural background than you, it's a good idea to find out what those traditions may be before you have flowers delivered. In most cases, mourners choose to send the flowers directly to the funeral home, which will handle displaying them appropriately in the room being used for the service. Most flower designs are placed on tall, thin stands that put the flowers at the attendees' eye level. The florist handling the delivery will be able to advise customers on appropriate choices and customs for a particular region or the specific funeral home. Many people choose to send memorial wreaths, sprays, or other large arrangements. Smaller pieces or plants should be sent directly to the family's home. Casket sprays or flowers that can go inside the coffin are usually given by the immediate family only as a way for them to pay a special tribute to their loved one. Following the funeral, the flowers usually are transported from the location of the memorial service. This should be arranged in advance by the company hosting the funeral, which loads, transports, and arranges the flowers around or behind the grave site. Since each cemetery has different policies about what it allows at the grave site, mourners should rely on the florist and funeral home to make recommendations about the specific etiquette for funeral flowers at a cemetery. Most cemeteries will allow any kind of floral arrangements, provided they are in sturdy supports and do not detract from the rest of the cemetery. Since many cemeteries allow floral arrangements to stay up for several days following a burial, keep in mind the climate and potential weather that the arrangement will experience. Ribbons, bows, and ornaments may look beautiful on the flowers, but they can discolor and fly away during a storm. Most cemeteries provide upkeep of the flowers while they remain at the site and can provide you will specific recommendations or requirements regarding their etiquette for funeral flowers at a cemetery. Silk flowers may also be allowed at some funerals, while others prefer only live arrangements. Guidelines for displaying arrangements may also vary by time of year, with longer display periods being allowed during the holidays and around Memorial Day weekend. 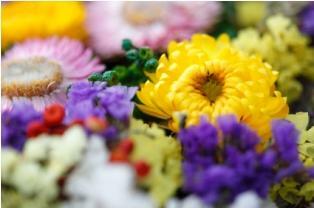 Once funeral arrangements have been made and publicized, mourners can find out a lot about appropriate flower arrangements through the cemetery and funeral home's websites. Some funeral homes may have partnerships with local florists for floral packages that are most suitable for the memorial service. The funeral home can also provide tips about flower arrangements for the cemetery, but checking the cemetery website is also a good bet. Some families may ask mourners to designate a gift to the deceased's favorite charity instead of sending flowers. If this is the case, it's important to follow their wishes. The family members will likely purchase their own flowers for the service, which will be moved to the cemetery for the graveside ceremony. Although additional flowers are most likely appreciated, mourners should honor the suggestions by the family, especially if the charity had special meaning to the deceased. Many mourners find that this is a comforting way to honor the deceased's last wishes. If the funeral has already passed, plants or flowers can always be sent to the immediate family's house in the weeks following the funeral.